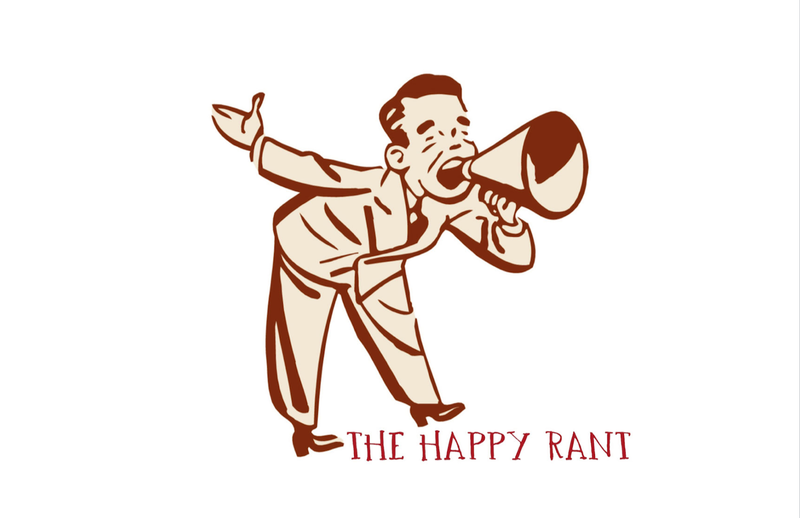 The Happy Rant podcast is a podcast in which Stephen Altrogge, Barnabas Piper, and Ted Kluck, cheerfully rant about all the things that don’t matter all that much. I have a minute commute, so I listen to podcasts and sermons quite a bit. I listen to everything from “Stuff You Should Know” to “Gut Check” podcasts and Matt Chandler sermons to John MacArthur sermons and I find myself looking for “The Happy Rant” updates more often than all. (please do episodes more frequently) Keep up the groovy sarcasm, and witty, lite nihilistic rants. BTW, BP, and TK, stop picking on SA. Homeschooling saves lives. The trio went on to talk about how complex a person I must be, based on the mention of the things I listen to during my commute to and from work. They also requested that I respond by drawing some lines between the sermons of Matt Chandler, and Johnny Mac, podcast “Stuff You Should Know” and the likes of “The Happy Rant”. They also requested that I explain how “homeschooling saves lives” I’m using this platform to respond because, quite frankly, a bit complex. My diverse selection of listening choices stems from the traditional to the current curiosity, and from the entertaining to the intellectual. Many years ago while my bride and I were attending a United Methodist Church, which at the time seemed like a compromise between us. (she was raised RC and I was raised in an more evangelical church). We heard about John MacArthur on a local Christian radio station and signed up for his tape ministry. I used to listen to his sermons every chance I got because his proclaiming of scripture struck a deep chord in me. I hadn’t heard the truth proclaimed in such a way since my youth. I really came to a clearer understanding of the Doctrines of Grace through the teachings of MacArthur. I still get jazzed about his sermons on occasion. I started listening to Matt Chandler several months ago to see what all the popularity was with the guy and I still peruse his podcast selections sometimes to see if something interests me. I also listen to Tim Keller (very frequently) and Alistair Begg (who doesn’t love his Scottish accent). My podcast choices are also diverse because I have several interests. I am a nerd by profession (I design software for an aviation company), and love many forms of music, a musician at heart, a sports fan, and I love to listen to and discuss theology. How does homeschooling save lives? Personally it saved the lives of our five children by allowing us to teach them curriculum we believed mattered, such as critical thinking, writing, real reading, most of which are seldom taught in public schools anymore. Our children were not sheltered from anything but the “let’s fight first, and vandalize later” mentality of the kids in small town Nebraska. They were plugged into sports teams, debating teams, and drama, including audio / visual training for the stage setups. They were actually able to participate in plays in a local professional theater. But most of all it saved the lives of the public school principal, and my wife, and I. Let me explain. The day two of our boys were picked up in the principal’s office for getting beat up by some other boys, and the principle suggested that our boys stick close to the teachers if they didn’t want to get into fights with other bullying students, was the day I saved his life from my wife. We asked “so basically, we should handicap our kids by making them hang with the teachers instead of making the trouble makers obey any rules?” His response was “That is the gist of it.” School administrators and principals no longer have a backbone. BTW, Barnabas, I also saved your life today, You should’ve seen the hair on the back of my wife’s neck stand to attention when you said “sheltering” our kids in reference to homeschooling. She was on her way to Tennessee in her mind. There you go guys. Hopefully you’ll read some of this on your podcast and give me more reasons to have to wear the shades and hat in public again.